This 200+ hour Expressive Arts Certificate program offers an introduction to the theory and practice of merging therapy and the arts. This training is relevant for School Counselors, Resource Teachers, Clinicians, Therapists, and Clergy wishing to add the expressive arts to their tool kits, as well as for Artists with therapeutic intentions with their work. Through their own active engagement in the arts, participants will explore the language of symbol through the lens of child and adolescent development. To support the application of these skills in diverse work settings students will receive 30 hours of group supervision during the Practicum Skills course. The program is made up of three compulsory courses and one elective. Register for the full program or individual courses. University of Winnipeg students may receive up to 15 credit hours of this training in their Post Baccalaureate in Education. Course hours can be used towards registration with IEATA as professional members. Requirements: professional arts based practice or a Bachelors degree in a related field (such as counselling, education, social work, fine arts, or psychology), along with some arts practice. Starting this July with EAT Studio I with Marg Janick-Grayston and Studio II with Dohee Lee. Downloadable course of study form (2019 - 2020) *Please note weekend class dates may be subject to change. Please contact info@wheatinstitute.com if you have any questions. "I am counted among a small handful of folks who were part of the first U of W & WHEAT Institute PBDE cooperative program in School Counselling and Expressive Arts Therapy. I could not have done this re-entry into the world of academia without the yummy goodness that was the experiential, immersive programming at WHEAT. It was what I'd describe as, 'A Scrumptious Education!'" 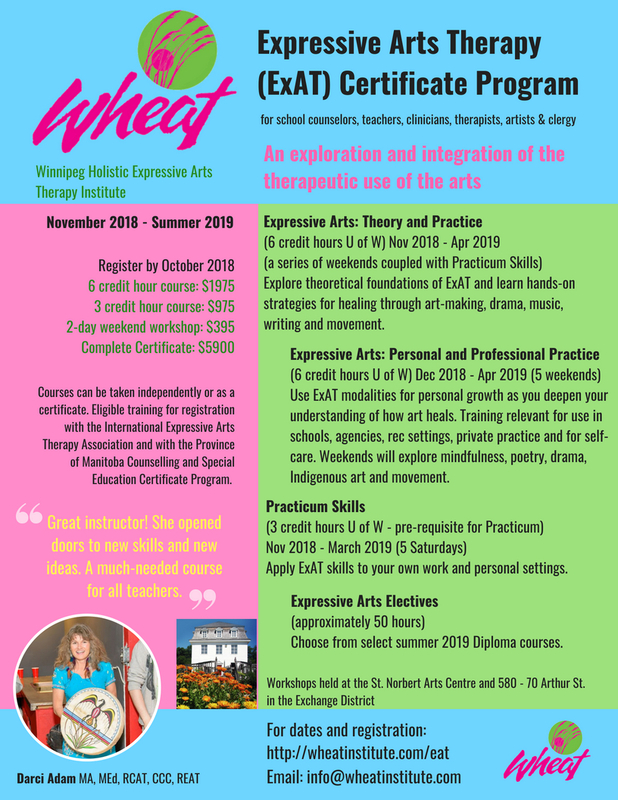 Expressive Arts Therapy electives offer an exciting opportunity to experience WHEAT courses with our most senior mentor instructors. Choose from select summer diploma courses, including courses in Poetry, Clowning, Movement, Drama Therapy or Expressive Arts Therapy with Kate Donohue. Explore the theoretical foundations of Expressive Arts Therapy and learn hands-on strategies for healing through art-making, drama, music, writing and movement. The curriculum will cover expressive arts strategies for use in school counseling and private therapy practice. Discover the role of expressive arts in modern therapeutic environments and actively participate in arts activities that can be used as critical counseling interventions for children and youth. Further develop your toolbox of expressive arts therapy skills in this applied counselling course. Students may use work or personal settings to bring forth case studies. This course serves as a Pre-Requisite to the Practicum Course in the U of W PBDE Program. * You may register for any individual weekend (2-day) workshop listed below. Personal and Professional Practice explore specific expressive arts interventions for personal growth as you deepen your understanding of how art heals. This training is relevant for use in schools, agencies, recreation settings, private practice and for self-care. In addition to focusing on specific facets of expressive arts therapy – such as Indigenous ways of knowing through the arts, mindfulness and movement – you will develop the skills needed to facilitate group and individual expressive arts interventions. In this segment of the Expressive Art Therapy Certificate class for Personal and Professional Practice participants will gain insights into the nature of mindfulness as they are guided in expressive arts processes that awaken them to the present moment, and open them to new insights that arise. Participants will experience the therapeutic value of art making as Mindfulness first hand through engaging in expressive arts modalities and intermodal processes that draw on breath meditations, visual arts, writing, movement, and sharing. Practical knowledge about how to plan sessions for groups, work from a person-centered approach with people’s art, and art making ideas to integrate into their personal and professional lives will be interwoven throughout this experience. This course will assist people in understanding the possibilities in combining art and mindfulness, and help them become responsible, trustworthy guides of this work. Poetry is a vibrant and powerful expressive language, practiced in cultures around the globe from ancient times to the present. Poetry draws on multiple levels of experience, desire and inspiration, and engages us on many levels at once, from the sensory and the emotional to the visionary. Reading/hearing and writing/creating poetry can be profoundly transformative experiences, and are accessible at many different ages and skill levels. In this two-day workshop, we will explore formal and expressive elements of poetic creation through reading, writing and performance exercises, with specific attention to (inter)cultural and (inter)personal influences and resonances. Over the course of the weekend, we will develop a repertoire of playful, creative, fun approaches to transformative poetic expression. Among other approaches, we will explore imagism, surrealism, ghazals and lament. Play and playfulness is an essential component of Drama. This two-day workshop helps students develop their creative imagination, self-expression, self-knowledge, and social relatedness through active participation in a variety of improvised dramatic activities. Students will become more comfortable with engaging in improvisation techniques and facilitating improvisation for others. The place and use of drama games will also be explored, as an important method of helping group members warm up both to drama and to other group members. This workshop is ideal for those wishing to learn more ways of incorporating drama into their teaching or guidance counsellor practice. The line between drama for creative expression and drama for the purpose of therapy will also be explored. This two-day workshop will explore Indigenous perspectives through art by using dialogue, sharing land base knowledge, and creating a personal connection to Spirit while creating a small piece of artwork from items that you have a personal connection/association with.